Janet Crossley is CAFOD’s Emergency Programme Manager for Nepal. One year on from the devastating earthquakes which struck Nepal in April and May 2015 watch Janet’s short video from Nepal and read how the generosity of supporters has helped our partners reach the people who were most affected. When I arrived in the village of Bungkot in Gorkha district, piles of rubble still filled spaces where houses once stood. Grass and crops had already started to grow out of the heaps of stone and dust that families once called home. I first visited Gorkha district in western Nepal three months after the 7.8 magnitude earthquake struck on Saturday 25 April. It devastated the lives of more than 5 million people, killing over 8,700, and reducing more than half a million homes to rubble. A second earthquake caused further destruction when it hit three weeks later on 12 May. 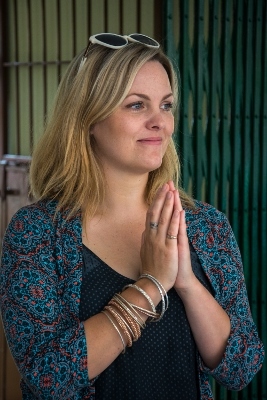 About the author: Jo Joyner is an award-winning actress and CAFOD supporter whose work includes No Angels, EastEnders, Ordinary Lies and The Interceptor. In July 2015, Jo travelled to Nepal where she met communities who were severely affected by the devastating earthquakes and saw how crucial the work of CAFOD’s local partners had been in providing life-saving aid. In the third of three blogs, Jo writes about her experience. Read Jo’s first and second blogs. Many of Nepal’s schools were decimated by the earthquakes and for safety reasons the government put a hold on all school attendance for a month. This was to give the authorities time to visit those schools that were still standing but fractured, to give them the official stamp from the engineers and approve them as safe enough to house the nation’s young minds. People I met told me that there was relief that the initial earthquake happened on a Saturday because this meant that many of the children were either outside playing or working in the fields. Open space is the safest place to be when there is an earthquake and looking at the rubble of a school in the heart of the old town of Kathmandu, I shuddered at the thought of that massive earthquake happening during the week, when families were separated and the schools were full. We visited Mary Ward School in Kathmandu, which Caritas Nepal has been supporting for more than ten years. The girls at the school are the daughters of migrant workers from the countryside who have come to the city from rural villages. The school is run by Sister Asha – whose name fittingly means ‘hope’. She has worked across South Asia for a lot of her formidable career, and when I asked her which country she preferred to work in, she replied sincerely, “I prefer to be where I am needed. I have God in my heart and do good work. So wherever I am, I am happy”. The school is a sanctuary off a bustling, broken, dusty road. When the school’s iron-gates close the peaceful, plant-draped courtyard of Mary Ward School wraps its knowledgeable bricks around you. We were greeted on arrival by an entire playground of immaculate students. I was instantly ashamed at the dishevelled state my twins are often in when they are thrown through the school gates – always late despite living on the doorstep. The students of this school were stood silently with radiant smiles, in pristine shirts and double plaits. They were proud. Proud to be dressed smartly. Proud to be clean and washed. Proud and hungry to once again be allowed to learn, read, write, sing and dance. About the author: Jo Joyner is an award-winning actress and CAFOD supporter whose work includes No Angels, EastEnders, Ordinary Lies and The Interceptor. In July 2015, Jo travelled to Nepal where she met communities who were severely affected by the devastating earthquakes and saw how crucial the work of CAFOD’s local partners had been in providing life-saving aid. In the second of three blogs, Jo writes about her experience. Read Jo’s first blog. I want to tell you about 35-year-old Kamala. A mother of three whose husband died in the earthquake, Kamala’s story will stay with me for a very long time. Kamala is a Dalit woman, from the most socially excluded of more than 125 castes that exist in Nepal – one that we in the West may have heard of as ‘untouchables’. As such, Kamala and her children live outside a village on a patch of land, low down on the edge of the mountain. An unenviable location when the rain washes waste and rubbish from the village down to her door. About the author: Jo Joyner is an award-winning actress and CAFOD supporter whose work includes No Angels, EastEnders, Ordinary Lies and The Interceptor. In July 2015, Jo travelled to Nepal where she met communities who were severely affected by the devastating earthquakes and saw how crucial the work of CAFOD’s local partners had been in providing life-saving aid. Whilst there she saw how CAFOD’s local partners were providing life-saving aid to some of the remotest. In the first of three blogs, Jo writes about her experience. The massive 7.8 magnitude earthquake that hit Nepal on 25 April killed nearly 9,000 people, brought over 600,000 houses tumbling to the ground and tore apart the lives of millions. As if that wasn’t enough, just over two weeks later, on Tuesday 12 May, a second earthquake hit – adding to the destruction and suffering of the Nepalese people. We were staying in Nepal’s busy capital city – Kathmandu. A mixture of three and four storey buildings that have evolved over time, been extended and added to with more bricks than mortar! There are a lot of crazy wires and power cables – that I’m glad I don’t have to make sense of – which the monkeys use as their highway. Traffic weaves between the locals who are completely unfazed. Everyone is keen to make their journey worthwhile – carrying as many cattle, goats or people in their cars or on their bikes as possible. All for one, and all for a lift! Kathmandu was badly damaged by the earthquakes, but I was struck by the resilience of the people who live there. Cities are cities the world over and like London after the bombings or New York after 9/11, the only choice for a city at the heart of its country’s economy is to soldier on and keep business open. Just as the threat of a terrorist attack doesn’t keep Londoners off the tube, the threat of an earthquake cannot keep the Nepalese from going about their daily lives in their capital city. If huge devastation and destruction was what I was expecting to see, I was – gladly – disappointed. 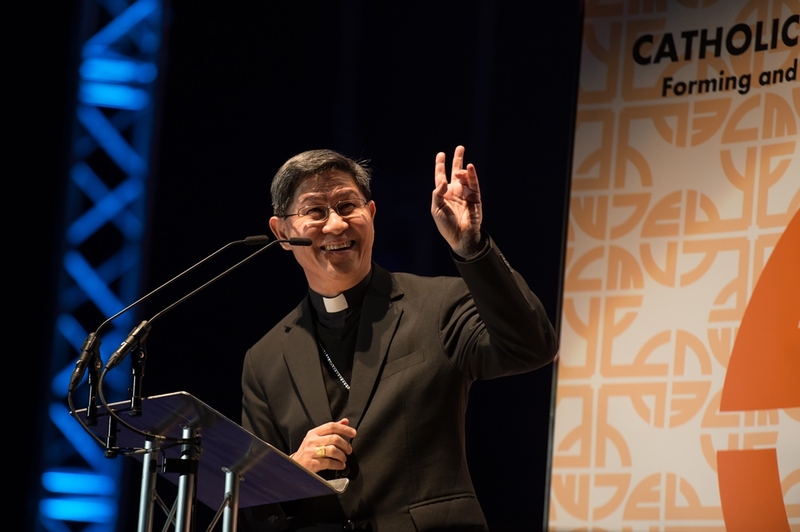 Cardinal Luis Antonio Tagle, from Manila in the Philippines, is President of CAFOD partner Caritas Internationalis. He reflects on Pope Francis’ encyclical and the devastating typhoon that hit his country in 2013. I do not need to tell the people in my country that we are living in a time of crisis. When Typhoon Haiyan caused widespread devastation across the Philippines in November 2013, it was immaterial as to whether it was caused by climate change or not; people suffered and the poorest were hit hardest. In such times of crisis what should our response be? In the Encyclical Laudato Si’ released this week, Pope Francis acknowledges the seriousness of climate change and how it is affecting the dignity of the most vulnerable, as well as the harmony between humans and nature. In the light of the Gospel of Creation, he calls us all to urgently respond to protect the gift of creation and the richness of life. He challenges us all, governments, businesses and citizens, to look deep within ourselves and find a common answer reflecting all peoples’ voices, for the appropriate response is not an easy or simple issue to be solved. This is a deeply rooted problem, which goes to the heart of who we are and our values. In line with his predecessors, Pope Francis is looking at the signs of the times that confront us. Laudato Si’ is a powerful and inspiring document calling us to a greater solidarity with the environment, a solidarity that binds the caring for people and caring for the environment. We must recalibrate our relationship with nature, the garden God has created for us, which we have looked upon as a subordinate to our desires and extracted from mercilessly without fear of the consequences. 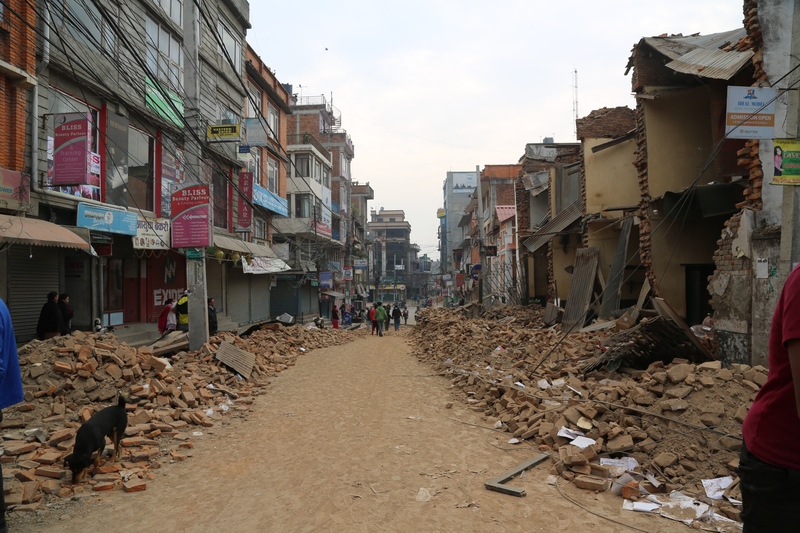 Lilian Chan, who works for our partner Caritas Australia, reports from Nepal. The earthquake struck without any warning. One minute I was filming an interview with a villager. The next, I was running to an open field as the ground shook violently and debris from houses flew overhead. It was a truly terrifying situation. As I watched the clouds of dust rising above collapsed houses, I knew that Caritas’ presence in this community would be more important than ever. After the ground settled, I walked around the village to survey the damage. Having lived through smaller earthquakes before, most people knew to take refuge in the open fields. I saw one young girl, probably no older than four, sitting with her family, her eyes wide with fright. People her age have never experienced anything like this. It has been more than 80 years since Nepal has seen an earthquake cause this kind of devastation. Reaching a magnitude of 7.8, the earthquake has killed thousands of people and the United Nations say that more than eight million people have been affected – more than a quarter of Nepal’s total population. Many homes, schools and hospitals have been destroyed, and water and sanitation services have been cut off in remote areas. As I travelled back into Kathmandu, the scene was heartbreaking. Buildings I had only seen for the first time days earlier were reduced to heaps of debris. People were evacuating their homes, with nowhere to take shelter. And we saw patients evacuated from the hospital. With nowhere to go, they had to be treated on the ground, out in the streets. I’ve always loved baking. But I’ve been doing a lot more since I became a mum. 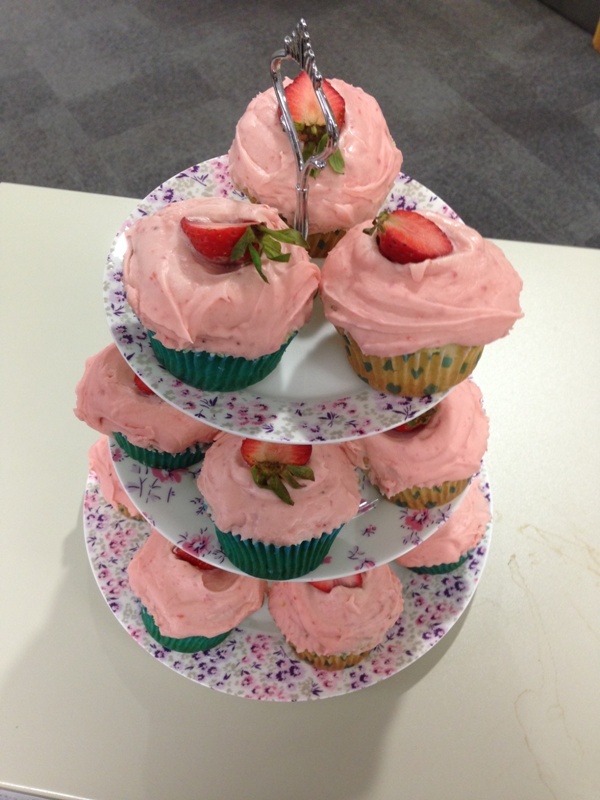 That’s why I’ve decided to double my baking this Lent to raise money for CAFOD’s Lent Appeal. Since I had my son Alfie, who is now two years old, I’m at home in the evenings more anyway and I find baking a great way to relax and unwind after a busy day. Not to mention the treat of a home-baked cake that you get to share with your family at the end. And I like the thought of Alfie having a treat where I know exactly what’s gone into it, with no nasties. There’s something so calming about baking that I don’t find with other cooking. Maybe it’s the precise measurements and instructions that give me a sense of control in a chaotic world. Or that every time you take a freshly-baked cake out of the oven, you can’t help thinking that a little bit of magic’s happened. The sloppy mess that went into the tin transforms into a spongy, golden, morsel that smells deliciously of warm, sugary sweetness. Our Fundraising Writer Mark Chamberlain visited Myanmar in 2014 to learn about the effects of storms and extreme weather. 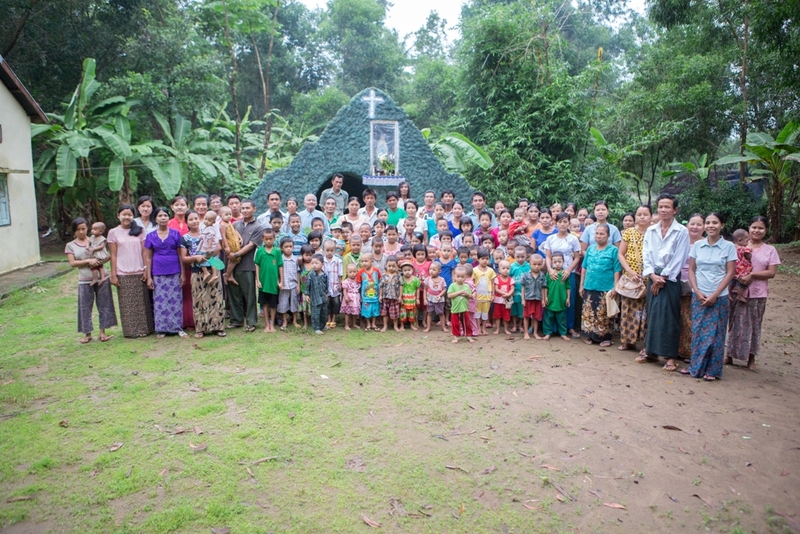 Myanmar is the focus for this year’s CAFOD Lent appeal which is being match funded by the UK government. 1. Footwear is essential. No matter how hot it is and how liberating the sensation of the jungle floor on your bare feet is, don’t be tempted to walk around without protection. The jungle is alive with spiders, snakes and the intimidating ‘scorpion king’. Bites can be lethal because both communities were are a long way from a hospital. 2. The ‘scorpion king’ is a giant centipede. It won’t kill if it bites, but it will hurt. A lot. Make sure you move your bed away from a wall if you are near one – this is so it doesn’t creep into bed with you for a snooze.